Held over 4 days this year to enable those who had a greater distance to travel to attend certainly seemed to work and by bedtime on the Thursday night the field was looking healthily full of enthusiasts with all manner of vehicles. Oddly enough, looking back to our first rally in 1989 the marques of vehicles attending has changed dramatically. 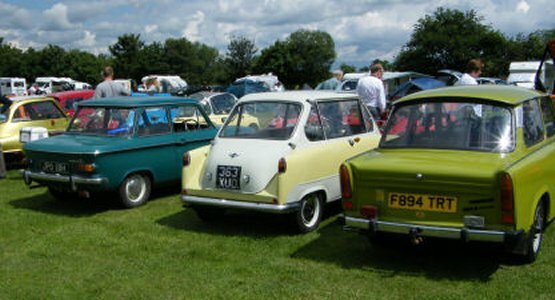 In those days the line up of Bond Minicars was by far the longest with no Heinkels / Trojans and very few Isettas, Reliants (the older Girder Forkers) were there in numbers too, but now the trend seems to have changed. 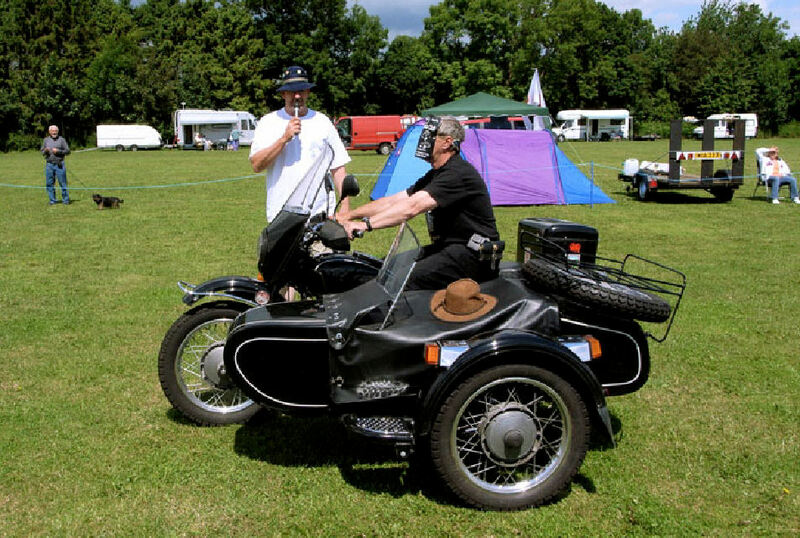 This year not only did Jim Hacking’s Janus attend but also two very nice Goggomobils, but both of them rare types too, there were Heinkel / Trojans in abundance, three Trabants (which were still behind the Wall on the date of our first rally), even a Barkas turned up! And of course the modern Zettas and Schmitts – makes you wonder what will be attending after a couple more decades? The Friday run was well attended setting off through hazy sunshine for a tour round the lower Wolds and stopping off for a bite to eat in Pocklington before continuing through the back lanes to our destination in York. Morrisons car park was chosen as we could park the cars safely there under the watchful eye of Ken, one of my security officers, whilst we all traipsed round the streets of York on a ghost hunt. 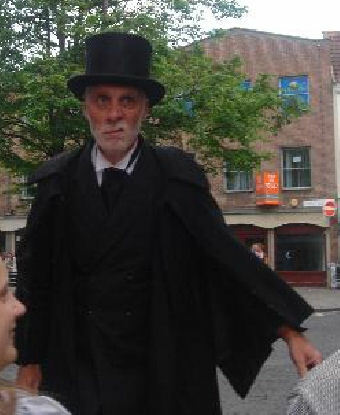 The leader of the Ghost hunt, a guy called “Andy Dextrous”, regaled us with gory tales of York and injected humour into the mix, finishing off with an assault on one of the poshest restaurants in York after which it was time to return to the site for a nightcap in the glasshouse. Saturday saw us on one of Paul Dorrington's treasure hunts with clues spread across several of the East / North Yorkshire villages and there was much coming and going down and around back lanes, sometimes in opposite directions whilst the participants sought out the answers to the questions, this sort of drive out is a good contrast to the set route one of the previous day and is a format that I’m sure will be repeated, much cheating and skulduggery was I’m sure, involved along the way but all that participated had a nice day out – and it STILL didn't rain! The start to Saturday evening was heralded by the infamous 4 “P”s meal (pies, potatoes, peas and pud) with the logo’d chefs whites being provided by Brian of Dragon design and embroidery – quick plug there Brian, thanks – this was quickly superseded by the legendary 'TomQuiz' the one where it doesn't matter who gets the most right, it’s Tom who decides who has won. As it was such a pleasant evening many took the opportunity to sit outside and chew the fat over a few beers whilst inside the greenhouse the evening was finished of thanks to Terry’s magic lantern show – an evening at the pictures (no jam jars required!). Sunday dawned and the sun was out, the line up assembled on the field and a couple of driving events ensued. Blindfold driving once again proved to be quite popular, even a couple of the motorcyclists attending took part in that one! Whilst the “Fork ‘n’ Chicken" event was good for laughs if not much else. Prize-giving time came round all too soon and John just managed to get the last prize handed out before the heavens opened and I mean REALLY opened – the rain was so painful to be out in that everyone took cover the best way they could. Once it had subsided the circus left town – only to find that 2 miles down the road it hadn't rained at all!! Still it held off for the rally and going by the weather that we have had recently we can be glad of that – hopefully next year – the Micro Maniacs 20th year – will see even more attending. Well done to all the prize-winners, and thanks to everyone who attended and helped to make this event as successful as it was. Remember - without you a rally is just an empty field!